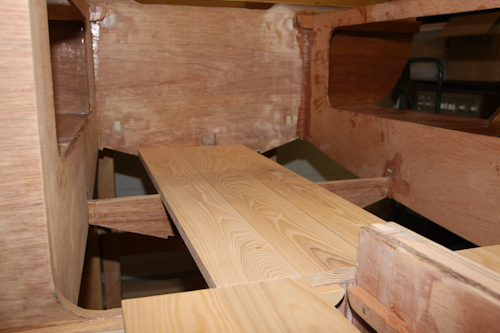 I am currently working on the interior of the boat while it is easily accessable. I am fitting the deck planks and have starting using another new tool for me. The jointer/planer is now getting some use as I square up the deck planks for a good fit. I will be finishing the deck clear coated and wanted a light colored wood for the deck and seats. I picked ash over the recommended choices of pine, mahogony, or douglas fir. I like the grain and color of this wood. It is heavier then these options, much closer to oak then pine for example. I hope it is not a poor choice because of weight, but if I get more low weight stability with this choice I would not be un-happy. Ash also would be a poor choice for frames or in other areas where water would accumulate due to lower resistence to rot, but my deck and seats have a lot of air space below so I don’t think this will be a problem for a boat stored on a trailer in the garage. I also ordered and picked up my steel centerboard. (still in my car trunk @ 90 lbs, photo later) It has been CNC cut to the outside diameter and hot dipped galvanized. I will still need to fair the leading edge and drill a few holes for hoisting points. I am planning to finish the centerboard off with a coating of graphite/epoxy.